Note: There’s a follow up to this review, here. 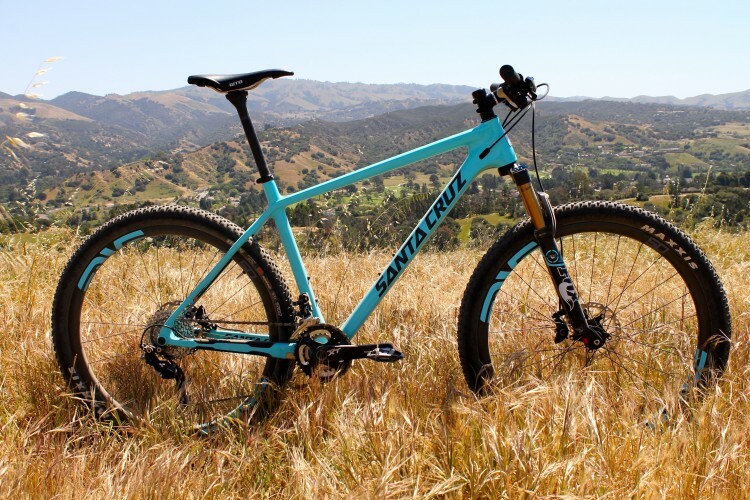 While Santa Cruz has done away with official model years in their lineup, they recently released some new updates to the Bronson that dramatically change the way this bike rides. Compared to the previous Bronson, the latest rendition now sports a 1-degree slacker headtube angle, putting the bike now at an even 66 degrees. The top tube is about an inch longer (23.46″ in the size-medium I tested), stretching out the cockpit even more. The chainstays are shorter, at 17.01″ on all models. 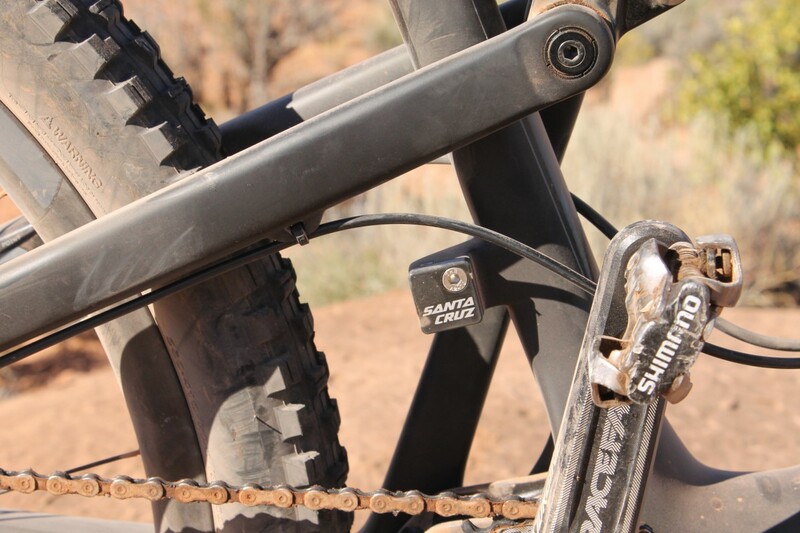 The rear end of the bike is Boost 148-spaced, and the frame features internal cable routing. Essentially, the Bronson has gone “more Nomad.” In addition to being longer and slacker, the Bronson also now uses the same suspension linkage as the Nomad. However, it still maintains 150mm of suspension travel front and rear. 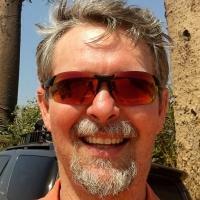 Be sure to click here to read more about the updates. 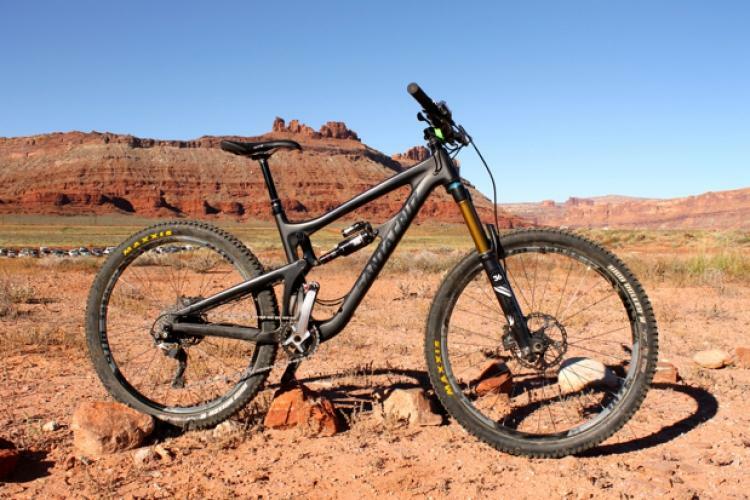 The bike I tested was made of Santa Cruz’s top-tier CC carbon. The parts spec included the Enve wheel upgrade, a SRAM X01 drivetrain, RockShox Pike fork, Fox Float X Evol rear shock, and SRAM Guide Brakes. Claimed weight for this build is 26.5lbs, but it comes at a cost: $8,600, to be exact. 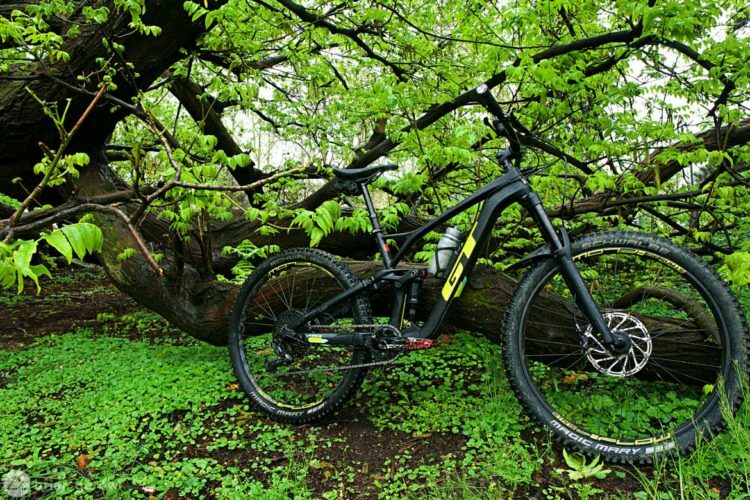 The Bronson comes stock with a 1x drivetrain, but it is compatible with a 2x system. The Bronson is feathery-light and well-spec’ed, but from the get-go I found it to be a rather uninspiring ride. The VPP suspension platform felt firm on the climbs, like this bike should be a great climber (as was the previous model), but the 66-degree headtube angle and what felt like an ultra-long cockpit created a very wandery feeling on the climb. The updated Bronson felt like it was the longest, slackest bike I rode at both Interbike and Outerbike, and all of those detrimental climb characteristics were in full-force. Getting the Bronson to cooperate and go where I wanted it when pointed uphill was an absolute chore. It is worth noting that, according to the specs, the top tube length on the Bronson is 23.46″, which is actually a bit shorter than the 23.58″ top tube on my everyday rider, the 150mm-travel GT Force. However, the geometry is 1.2 degrees slacker on the Bronson, and I already felt like my Force was a bit wandery on the climbs with its current configuration. To compensate on the Force, I regularly utilize a Fox TALAS fork, which allows me to drop the front end of my bike and steepen the headtube angle for climbing. 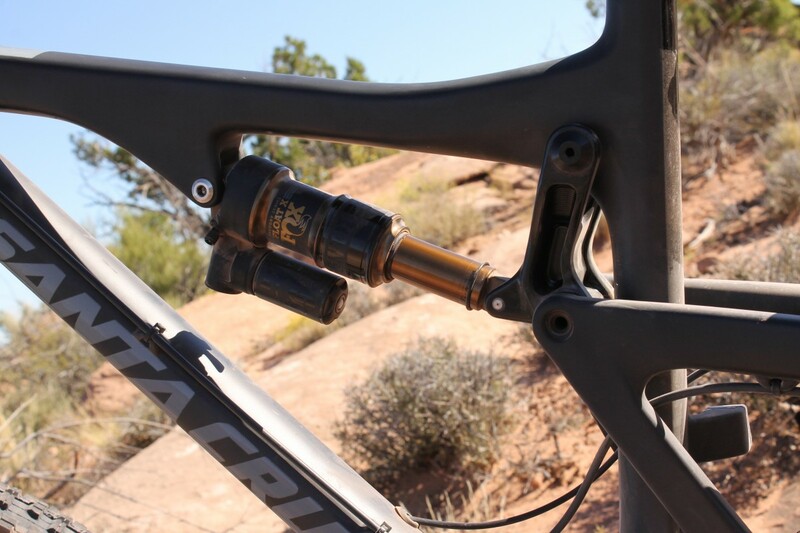 While the RockShox Pike is available in a travel-adjust model, it doesn’t come spec’ed on the Bronson. One might think that the geometry updates might fix the one complaint I had about the previous Bronson, which overall I thought was fantastic. That complaint was an abundance of pedal strikes. However, I still encountered a very similar amount of pedal strikes on this year’s Bronson, and it was the worst of all the bikes I’ve demoed at both Interbike, Vail Outlier Offroad, and Outerbike this fall, in the pedal strike department. Thanks to the slack head tube angle and the long cockpit, you’d expect it to be great in the descents. 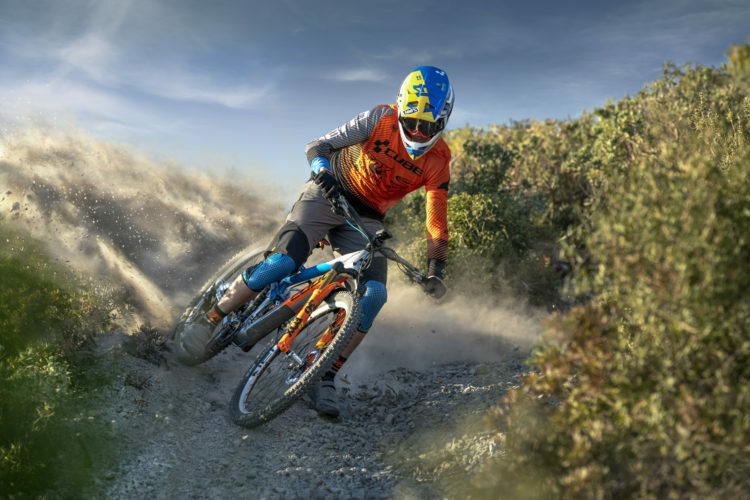 On the uber-steep Killer Be slickrock descent, the geometry of the Bronson felt on-point–but there are very few trails out there that are that steep. 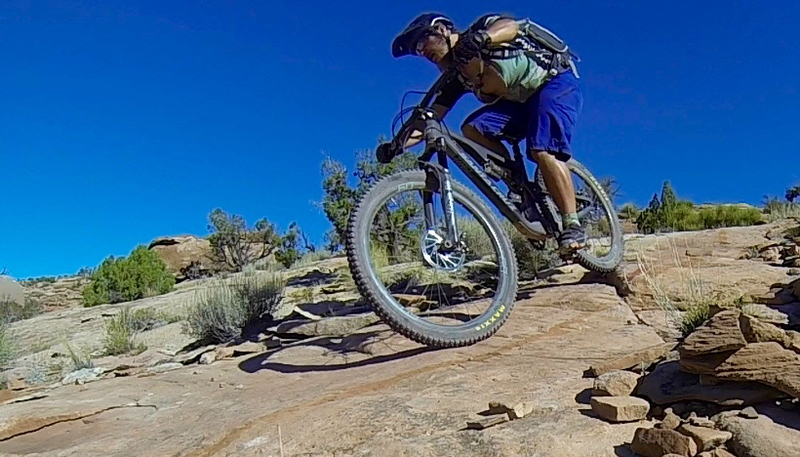 Also, generally when a trail gets that steep, it’s not smooth slickrock–it’s chunky and gnarly. Despite 150mm of travel front and back and proven suspension components, I found neither end of the suspension to work well on the Bronson. Through moderate-speed, moderately-sized obstacles I had no issue, but I wouldn’t buy a $8,600 bike for moderate obstacles. When it came to bigger hits, the firmness of the rear end didn’t transition into a burly, plush feel as I expected, after coming off of the Intense Tracer 275c (one of the best bikes I’ve ever ridden) with the same VPP suspension design. Instead it felt, again, uninspiring, and had me wishing for more travel. On the front end, despite setting sag correctly and running a fork I already love (the Pike), I found myself bottoming out the travel on obstacles that I didn’t think would be an issue. Now I could potentially have bumped up the fork pressure a bit, but as I mentioned, I felt like the tech at the booth had setup the suspension correctly. Yet I bottomed out the fork and almost crashed on a not-that-bad obstacle. Honestly, I was kind of shocked to note the poor front-end suspension performance, and I don’t know what to attribute it to. Could it be because the Pike was a 150 instead of the 160 I’m used to? Could it be that the tweaked geometry doesn’t actually ride that great in techy situations, either? I’m currently undecided on what actually caused this issue, but I can definitely note that it happened more than once over the course of my 10-mile test ride. Maybe you think I’m totally off base here. Maybe you think my ride totally missed the mark. But when I compare the geometry stats of the current Bronson to the current Nomad, my head starts to spin. To begin, the Nomad sports a 165mm-travel rear end and a 160mm front end–15mm and 10mm longer than the Bronson, respectively. 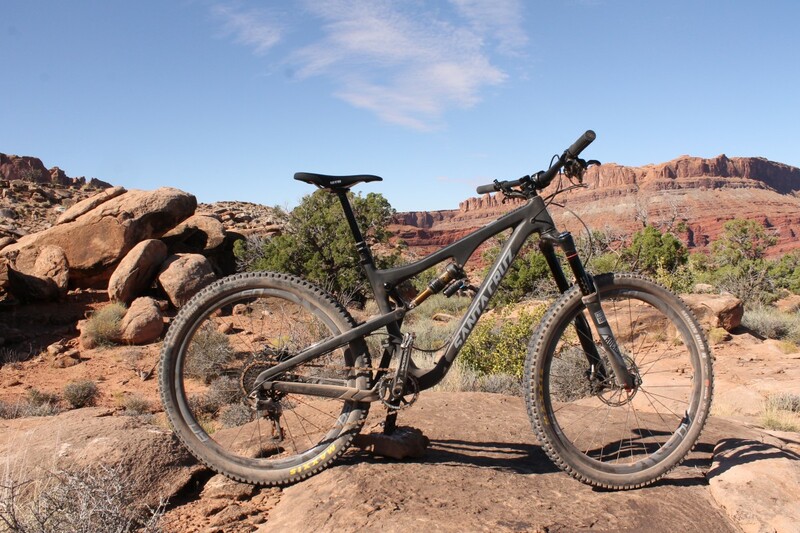 However, despite that longer travel length, the top tube is actually shorter by 0.46″ in the size-medium Nomad than it is in the size-medium Bronson. While the headtube angle is indeed a degree slacker in the Nomad than the Bronson (65 vs 66), that makes sense with the longer travel. However, the seattube angles are nearly identical, with the Nomad actually being a touch steeper at 74.2 vs 74 in the Bronson. BB height is almost identical (Nomad is 4 hundredths of an inch lower). 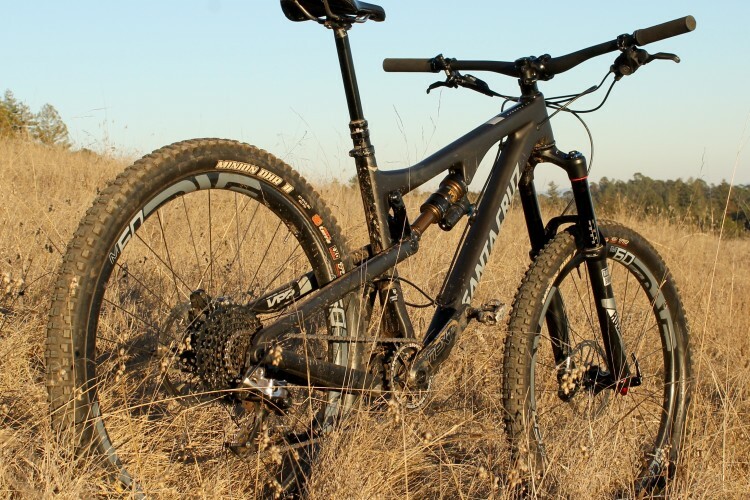 Chainstays are a mere 4 hundredths of an inch longer on the Nomad vs the Bronson, and the stack is just a hair taller, at 23.62″ vs 23.43″ in the Bronson. However, again, coming back to reach, the Nomad’s reach is shorter than the Bronson’s by 0.4″. So what do you get when you buy the Bronson over the Nomad? You get a longer cockpit, but the travel amount doesn’t keep up with that added length. Instead, it drops by 10mm in the front and 15mm in the rear. The headtube angle gets a bit steeper at 66 degrees vs 65, but that makes sense in keeping with the fork length. You drop a bit of weight as well. The end result? 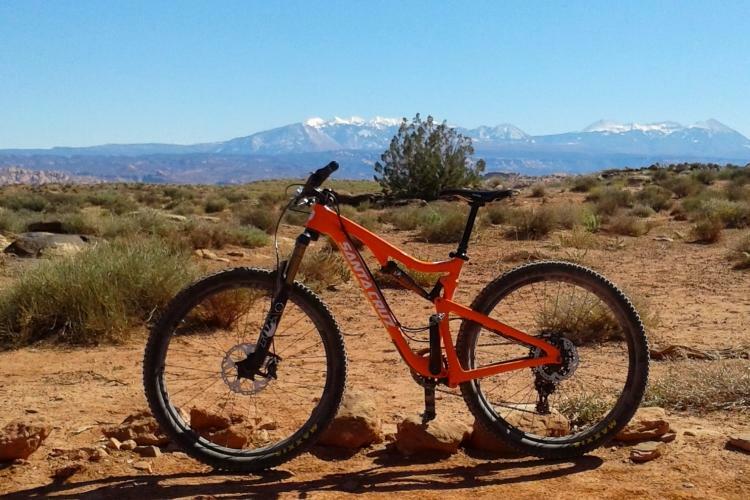 The Bronson is a less capable descending version of the Nomad that doesn’t provide shorter riders with many–if any–tangible climbing benefits. Based on previous tests I’ve done aboard their bikes, I’ve come to expect excellence from Santa Cruz. Also, I definitely expect excellence from any bike with a $8,600 price tag. But I found no excellence in the latest rendition of the Bronson. Yes, it’s light, but that doesn’t really matter if the performance is uninspiring or worse, if it isn’t up to the standards of a bike of this supposed caliber. I’m sure plenty of people will buy and love the latest Bronson, because Santa Cruz is such a hot brand. But for anyone looking at a Bronson purchase, I’d highly recommend that you test it back-to-back with other bikes of the same supposed caliber that are currently on the market. Who knows? 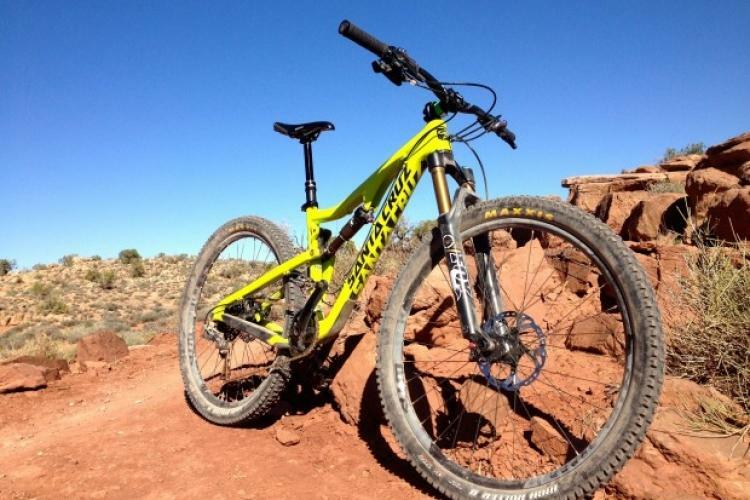 Maybe the Bronson’s new geometry will work better for you than it did for me. But if you ask for my 2 cents, there are at least a dozen other bikes on the market in this category that I would rather ride before I’d take the Bronson out for another spin. Thank you for writing what you really felt. My buddy has a 2015 Bonson C, which I have ridden a bit, and would not mind upgrading to myself. Naturally I am interested in the changes for 2016, and really appreciate what you thought about it. Thank you for your frank review Greg. Really appreciate it. I have 2014 Bronson that I have really enjoyed. 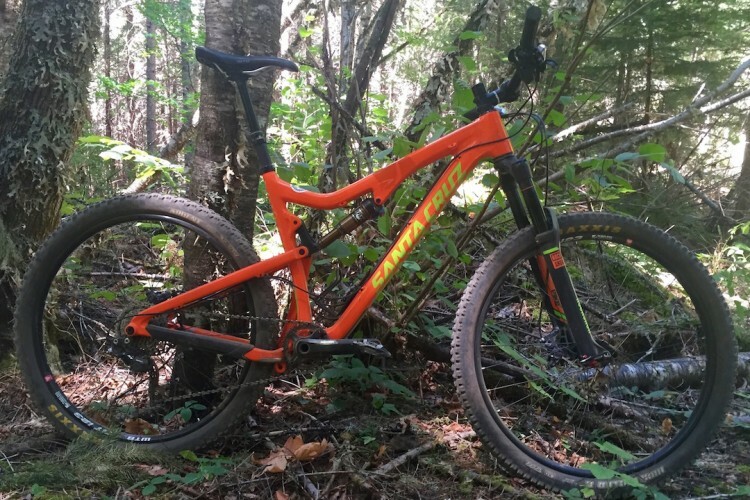 It looks like Santa Cruz missed a mark with the geometry of new version. There was no need to make it slacker and extend the top tube, when there is Nomad already. Not only a good rider, but a good sincere writer as well… Keeping it honest and genuine!! Owning a santa cruz blur ltc and repeatedly demoing 2014 and 2015 bronsons @ the local shop and loving all of them, this is sad to hear as I was planning on getting a new bike this year. Guess I will wait, or try out a 5010.